Does your company have a social responsibility? In today’s new economy, companies are facing rising expectations from their customers, employees and investors to both improve their bottom lines and become better corporate citizens by caring for, promoting and partnering with social investments. Companies associated with a cause, separate themselves from the noise and clutter, and rally their passion, grow their consumer base and drive brand loyalty. 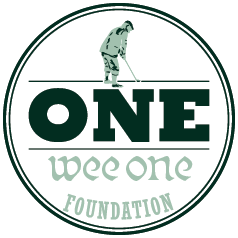 The Wee One Foundation offers you the opportunity to tie your brand to a group that is unlike any other in the golf industry. The Wee One Foundation offers many opportunities for your organization to shine within the industry. For example, the “One for the Wee One” campaign can be tailored to suit your needs through cobranded marketing, company recognition and product promotion concepts. These practices help create heightened brand awareness, drive customer loyalty and increase your visibility. The Wee One Foundation relies on financial support from organizations such as yours, and celebrates those who pledge their commitment. It is a two way street and together we can make a difference. The most overwhelming comment made about the Wee One Foundation is, “they are doing a lot of good,” for both the individuals and families we support and the industry, itself. Partner with the Wee One Foundation, and your customers, employees and shareholders will recognize that your organization shares in our support of the industry. Thank you for your support of Wee One Foundation. Below are tips to help you determine if a cause-related marketing promotion with Wee One Foundation will meet your business objectives. Please review the following carefully before completing the Corporate Partnership Proposal Form. Wee One Foundation owns certain trademarks including the Wee One Foundation Logo, One for Wee One Logo and One for Wee One (collectively the “Licensed Marks”). Written permission from Wee One Foundation is required to use any Licensed Marks. A minimum of one year in business is required for any party seeking a partnership with Wee One Foundation. To ensure that all cause-related marketing promotions benefiting Wee One Foundation are consistent with best practices, Wee One recommends a guaranteed ﬁnancial commitment. Please see the Corporate Partner Proposal Form for additional information.